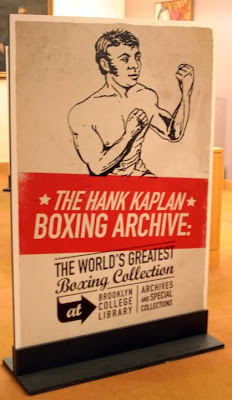 Poster For An Exhibit of Materials From The Hank Kaplan Boxing Archive. The rags to riches story behind Brooklyn College's Hank Kaplan Boxing Archive just got a little richer: on April 16, 2010 the collection's chief archivist, Professor Anthony Cucchiara, became the winner of a $315,000 endowment from the National Endowment of the Humanities (NEH) to organize the largest and most extensive boxing collection in the world. "This two-year grant will allow us to process and preserve this invaluable collection that spans two centuries of boxing history," says Prof. Cucchiara. Finding the funds to organize, catalog, and digitize the 2,600 books, 500,000 photographs and negatives, 1,200 posters, reams of clipping files, scrapbooks, documents, letters, and memorabilia that make up the Kaplan collection was a daunting task. A $50,000 seed grant from Barry Feirstein, Chair of the Brooklyn College Foundation, allowed Prof. Cucchiara and his team, Assistant Archivist Marianne LaBatto and Conservator Slava Polischuk, to begin an inventory of the over 2,000 cartons of material. But the goal was to make the entire collection available to the public, in accordance with the donor's wishes. A Rare Poster For A Fight That Never Took Place. 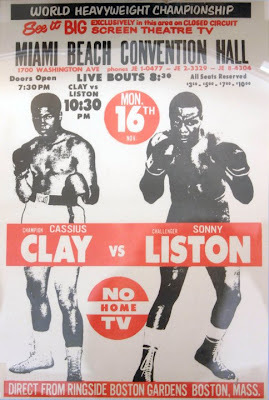 The Bout Was Rescheduled When Then Cassius Clay, Later Muhammad Ali, Became Ill.
Fortunately, the Brooklyn College academic charged with the task has more than a professional interest in this treasure trove of boxing memorabilia. Anthony Cucchiara works out every Tuesday, Thursday and Saturday at Gleason’s Gym in Brooklyn with Hector Rocca, who trained the recently-deceased fighter Arturo "Thunder" Gatti, as well as "Million Dollar Baby" star Hilary Swank. 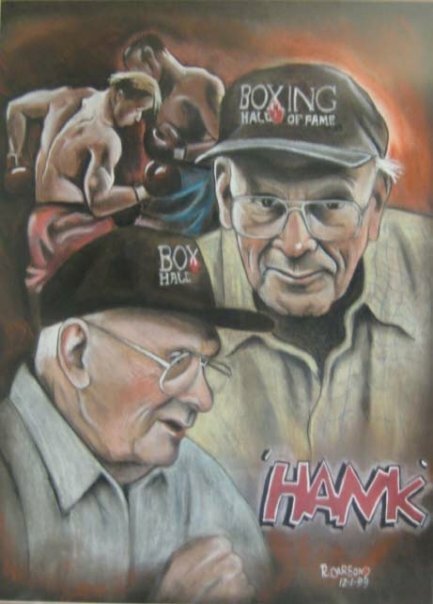 It was the friendship between the pugilist professor and donor Hank Kaplan, an authority on boxing nicknamed "the sweet scientist," "the human encyclopedia," and "the Lord of the Ring," that resulted in the $3 million collection coming to Brooklyn College. Hank Kaplan's life story sounds like something straight out of the Dead End Kids. Kaplan was born in Brooklyn, New York in 1919, the son of Jewish immigrants from Lithuania. His father died when Hank was only nine, leaving his seamstress mother to raise four children alone. At times the family was so strapped for cash the children were temporarily placed in orphanages. His interest in boxing began when he suffered a bloody nose in a boyhood fistfight at a charity summer camp for hard luck city kids in upstate New York. He fought as an amateur middleweight, and later turned pro, winning his first and only bout. But this was in the early 1940's, and World War II ended his ring career. Kaplan joined the U.S. Coast Guard upon learning that its Director of Physical Training was former heavyweight champ Jack Dempsey. 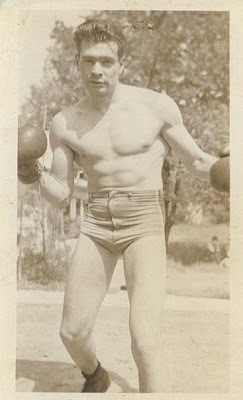 Hank Kaplan At His Fighting Weight In The 1940's. During the War, Kaplan was trained in the disinfection of contaminated ships, and after attending the University of Miami on the G.I. Bill, he began a career with the Centers For Disease Control (CDC). But his passion for prizefighting never waned. He retired at age fifty-five, and began a second career with his first love. In the 1950s and 1960s, he was a publicist for the brothers Chris and Angelo Dundee, who molded the careers of Muhammad Ali and other champions, and he occasionally promoted fights on his own. He served as a public relations consultant to top fighters, founded the Wide World of Boxing Digest, and wrote dozens of articles on the sport for such publications as Boxing World, The Ring, the London Times, and Der Stern. He served as a boxing consultant to Sports Illustrated for 24 years, and later worked for ESPN, HBO and Showtime. Over time Kaplan became known as a scholarly, reliable, and eloquent source of information on anything and everything related to the fight game. Throughout his life Kaplan collected memorabilia related to the sweet science. Much of his collection was given to him by trainers and fighters he befriended. He knew every boxing champion of his day, including Jack Dempsey, Joe Louis, Rocky Marciano, Henry Armstrong, Jake LaMotta, Sugar Ray Robinson and Sugar Ray Leonard. He met an eighteen year old kid named Cassius Clay at the Fifth Street Gym in Miami in 1960. By the time Clay became "The Greatest," Kaplan and Heavyweight Champion of the World Muhammad Ali were fast friends. Kaplan's Comprehensive Collection Includes Products Endorsed By "The Greatest." But Kaplan's one-man history of boxing isn't just about the champs. He kept detailed records on virtually every professional boxer and trainer in history, and on judges, referees, and announcers, too. Kaplan kept vast files on what he called "fistic arcana," such as mainstream and unorthodox training methods, boxing in the movies, animals in boxing, bare-knuckle fighting, and Jewish and Italian boxers who adopted Irish names. Despite his association with big-name boxers, Kaplan was devoted to the memory of each and every fighter. His files on now-forgotten fighters like Joe Grim, a palooka whose professional record of 6-91-9 was the worst of all time, were as important to him as the rest: "Even when I was 16 or 17, I said there's got to be some way to remember them," Mr. Kaplan told the South Florida Sun-Sentinel in 1995. "If someone were to ask me why I keep the archives, I guess that's what I'd say: Someone has to be charged with remembering them." By the beginning of 1990, Kaplan's collection filled two rooms in his Kendall, Florida home, and an entire two-car garage. Then in 1992, Hurricane Andrew ripped the roof from the garage, putting much of the collection at risk. Kaplan was able to save nearly everything he had collected, but he began to think seriously about what would happen to his vast historical archive after his death. David Smith, a supervising librarian at the New York Public Library, learned about the Kaplan archive from the writer David Margolick, who was researching his book, Beyond Glory: Joe Louis vs. Max Schmeling, and a World on the Brink. Then Smith read a 2005 article in The New York Times that mentioned Professor Tony Cucchiara's devotion to boxing. Smith arranged the introductions that led to Hank Kaplan's archive finding a new home at a college in his boyhood home town. A Portrait Of Hank Kaplan By Artist Bob Carson. Hank Kaplan became ill in late 2007, and Prof Cucchiara received a call from his daughter, Barbara Kaplan-Haar, who informed him that her father intended to leave the entire collection to Brooklyn College. Mr. Kaplan died two weeks after that call. "I think Hank liked the idea that the collection would be coming to Brooklyn," Professor Cucchiara said. "And it could be that he thought, since I'm both an academician and a boxer, that I would not let him down." 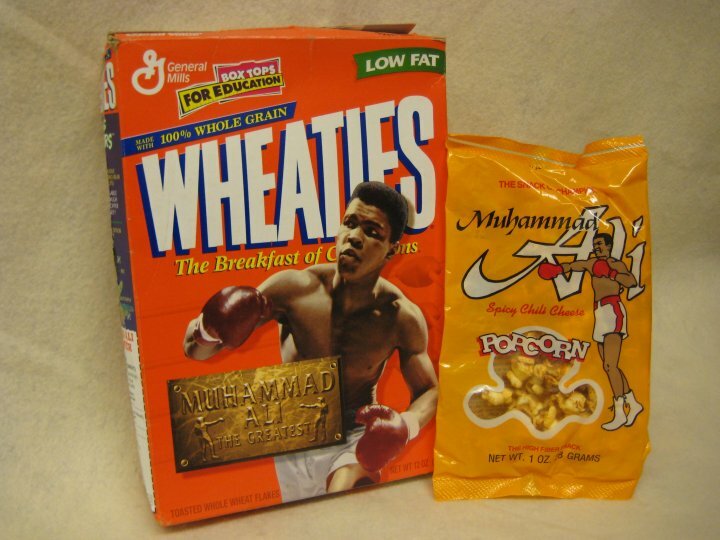 "Some people would want to turn up their noses at a boxing collection," he added. "But the story of America is in this archive. Boxing is more than a sport. It's a lens through which to look at American cultural history." The professor and the donor share an undying admiration for the sweet science, "None of this is for my own glory," Kaplan said of his collection. "I have no dreams of great rewards. My love of boxing comes first." I am sure that archiving this material is important. But I don't have much respect for a "sport" whose purpose is to knock their opponent unconscious.